Mild WNC summers make us want to take everything outside, including the kitchen. On the grill, meats and veggies cook quickly with just the right combination of crisp and juicy textures, and the smoker—which you can pretty much fire up and forget—produces tender, flavorful results. To find an optimal cut for your warm-weather meals, visit a local butcher shop. WNC’s small farms mean you can buy fresh, quality meat from a butcher who can explain just how to cook it. Lightfoot recommends asking what the animals are fed. The most flavorful cuts are raised on diverse diets. The pork in the shop comes from owner Ann Rose’s farm, where the hogs feast on acorns and pumpkin. Casey McKissick of Foothills Deli & Butchery in Black Mountain and Asheville agrees with the merits of this technique. He calls lean cuts like brisket and pork shoulder “more time, more adventure” and recommends cooking them at a low temperature for an extended time. For the grill, McKissick suggests sausage. Foothills offers a variety of smoked links. High heat is crucial for this and other grilled meats such as pork chops, rib eyes, and New York strips, he says. 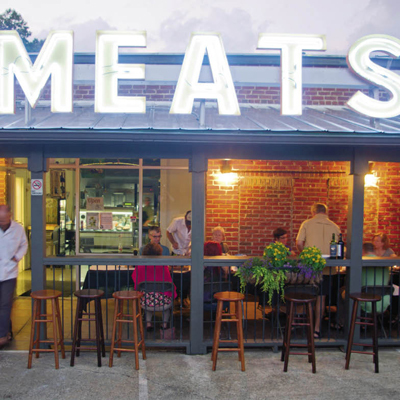 Butcher shops are becoming a popular choice for meat lovers in this region. Foothills opened a second location in Asheville in March, and McKissick says the business plans to expand further, as more home cooks catch on to the benefits of the butcher shop.